You listened to “No Tears Left to Cry” on repeat during the demise of your own relationship, then again when Ariana Grande and Pete Davidson broke off their engagement earlier this week. But here’s a hot take: What if “No Tears Left to Cry” isn’t a song about love at all, but actually, a song about voter registration? 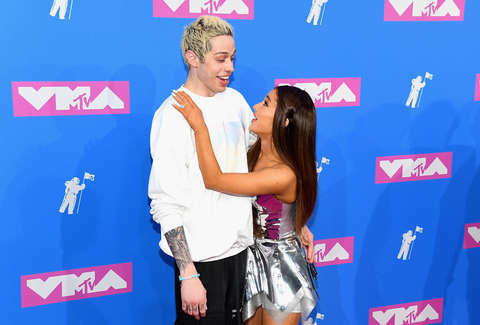 On Sunday night, when speculation about the nature of the celebrity break-up went viral, internet troll extraordinaire Tim Cigelske tweeted a tender photo of the now-severed couple with the caption, “Wow I can’t believe this is why Ariana Grande and Pete Davidson split up,” followed by a shortened link. The link, hidden from view thanks to bit.ly, was not the pathway to some exclusive hot goss about Grande and Davidson (who are not well-suited to a kitschy couple name, which may have had something to do with their break-up), but rather, a link to Voter.org, where curious fans could register to vote, confirm their voter locations, and track down their local polling offices. Instantly, the tweet went viral, with over one millions hits. Cigelske can’t take full credit for the ingenious meme ploy, however. Last week, Ashlee Marie Preston posted a similar tweet reading, “Welp...it’s official...Kim Kardashian finally decided to divorce Kanye West…” followed by a different registration link -- which got over 2.5 million clicks. According to the most recent gallup poll, 58% of U.S. adults will actually vote this year, while only 26% of Americans aged between 18 and 29 will show up at the polls. So maybe some good meme-campaigning is exactly what we need. Cigelske, who does not identify as a fan of Ariana Grande and/or Pete Davidson, does offer his “condolences to them both." So when we all truly have no tears left to cry for the unhappy couple, at least we’ll have registered to vote. Eliza Dumais had unfortunately registered to vote before she saw this meme. Follow her on Twitter.